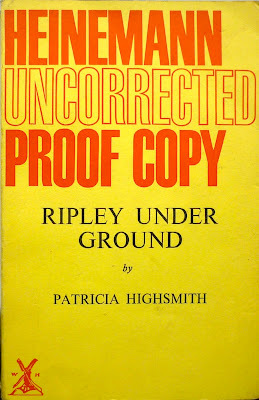 It's an uncorrected proof of Ripley Under Ground, the second of Patricia Highsmith's five Tom Ripley novels, which was published in hardback in the UK by Heinemann in 1971, the year after the US Doubleday edition. Despite already owning a copy of the Heinemann first of Ripley Under Ground (actually two copies... don't ask), with its Mon Mohan-illustrated dust jacket (see below), I conspired to win this proof as well when it popped up on eBay a while back, for no other reason than I fancied a look at it. On first inspection it appears to be almost identical to the proper Heinemann first; obviously the cover is a text-only, thin card affair as opposed to the first edition's illustrated wrapper and boards, but the interiors look pretty much the same. Look closer, however, and there are very slight differences – such as, for example, a missing quote mark on page 20 of the proof, which has been corrected for the final edition. Because of course it's an uncorrected proof, i.e. a galley, intended for proofreaders, reviewers, libraries, and possibly even Highsmith herself. 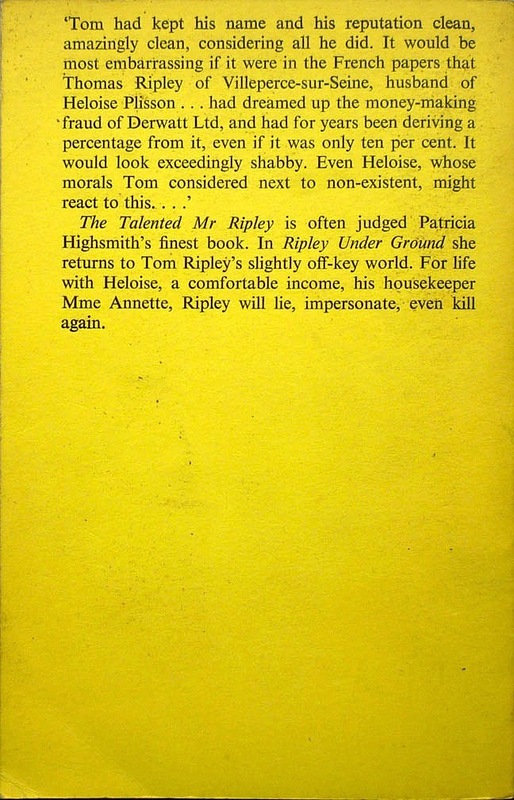 Ripley Under Ground is set five or six years after The Talented Mr. Ripley, although in reality fifteen years had passed between the two books, which means that either Under Ground is set in the then-past or Talented was set in the then-future (I'm guessing the latter is more likely, as at one point in Under Ground a policeman finds a buried coin dated 1965 and the inference is it's been there some time). Either way, Tom is now thirty-one, and has secured for himself the kind of comfortable, idle existence he worked – and killed – so hard for in Talented. He lives with his wife of three years, Heloise, in a large house, Belle Ombre, in rural France, spending his time pottering about in the garden, reading, painting, and occasionally acting as a middle man for a fence friend of his, Reeves Minot (and oh, what an attractive way of life it is – at least, to me). Heloise has a stipend from her father, and Tom has Dickie Greenleaf's inheritance, but Tom also derives an income from an art forging ring in England, and it's the unravelling of this that forms the basis of the plot. 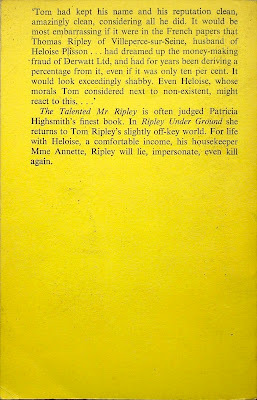 In making art, painting and forgery the focus of the book, Highsmith is picking up on themes she established in The Talented Mr. Ripley. Dickie painted, as did Tom – except of course Tom only painted as Dickie, having assumed Dickie's identity. Right at the end of Talented, however, Tom discovers a genuine interest in painting, determining not so much to paint himself (although by the time of Under Ground he has, as I say, taken it up, and as a painter believes himself to be, amusingly, "worse than Dickie"), but "to collect paintings that he liked, and to help young painters with talent who needed money". In a perverse sort of way, this is what he does prior to Under Ground. As is established at the start of the novel, when Derwatt, a painter in whom Tom became interested, died a few years back, Tom suggested to Derwatt's friends that another painter, a friend and admirer of Derwatt's named Bernard Tufts, forge further Derwatt paintings, and helped concoct a story that Derwatt was in fact still alive and living in Mexico. Tom has two Derwatts hanging on his walls at Belle Ombre, one real, one fake, and it's telling that he prefers the Tufts fake to the genuine Derwatt. But there are other strands from Talented that Highsmith immediately picks up in Under Ground. Tom's association with the shady Reeves Minot speaks to Tom's fascination for the criminal, and he's soon called upon to impersonate Derwatt himself, donning make-up and a fake beard for a press conference in London, echoing the moment in Talented when he briefly tries out eyebrow pencil and putty on his nose to impersonate Dickie. Tom's skewed perspective is highlighted when he takes delight in the obscene but witty graffiti scrawled on the London Underground, and when he observes that "Some people didn't know how to run a business" upon learning that the gallery which sells Bernard's Derwatt fakes hasn't accounted for how the paintings might have arrived from Mexico – as if faking records and ledgers were a typical business practice. 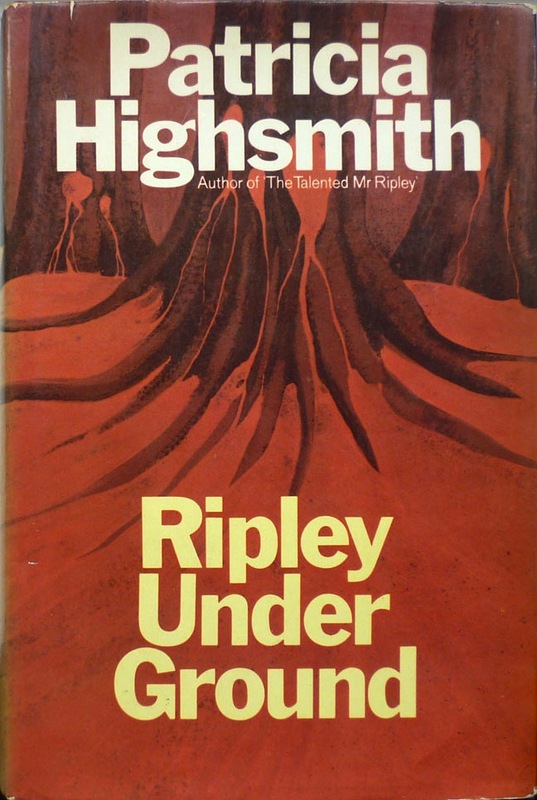 Highsmith professed herself very pleased with Ripley Under Ground when she finished writing the novel, and it's easy to see why. There's an unhinged, giddy, almost farcical quality to the book – a grotesque hall of mirrors, with Bernard's forging of and Tom's impersonating of Derwatt reflecting Tom's impersonation of Dickie and forging of his will in Talented. (Derwatt, Dickie... is it a coincidence that their names both begin with "D"...?) Moreover, Dickie's cousin, Chris, is staying with Tom when Bernard comes to stay at Belle Ombre also, Chris's expressions often reminding Tom of Dickie. On top of that, after six years Tom has just killed again, this time an art collector, Murchison, who had come to suspect Derwatt was being forged. Tom buries Murchison's body in the woods out back of his house before enlisting Bernard's aid in moving it and dumping it in a river instead; with all this going on, it's little wonder that Tom comes close to cracking up. Of course, Highsmith is performing the same trick she did in Talented: getting the reader to empathize and even sympathize with Tom. 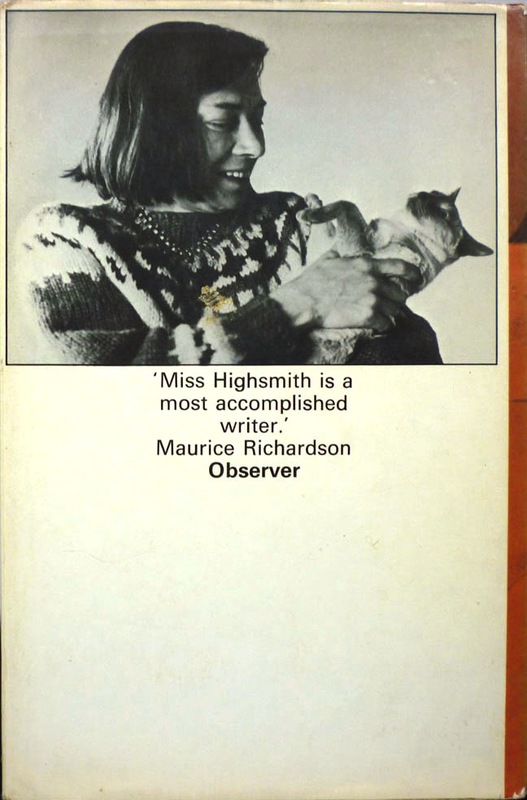 Her aim with Talented, as quoted from her diaries in Andrew Wilson's biography of Highsmith, Beautiful Shadow, was to show "the unequivocal triumph of evil over good, and [rejoice] in it". She added: "I shall make my readers rejoice in it, too." 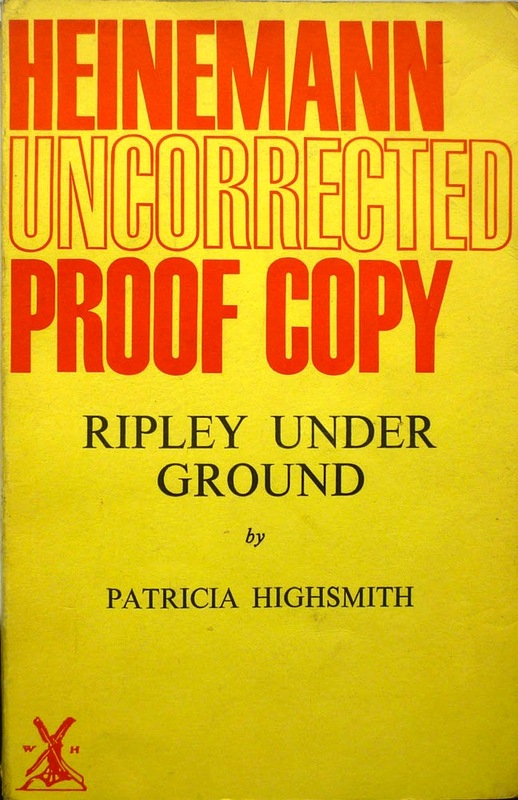 That said, in Under Ground – unlike, arguably, in Talented – Highsmith leaves the reader in no doubt as to Tom's true nature: after Bernard, whom Tom greatly admires (although perhaps more as a forger than a painter), tries to kill him (the first of two attempts, the second of which will see Tom buried alive – hence the novel's title), Bernard tells him, "I detest you – because all this is entirely your fault. I should never have agreed to it – true. But you're the origin." After which Tom reflects: "Tom knew. He was a mystic origin, a font of evil." The realisation that Tom full well understands who and what he is is perhaps more disturbing than the revelation that he's evil incarnate. It's a stark illustration of Tom's lack of conscience: even with that knowledge, he's perfectly able to continue operating and to live his life; to appreciate art; to be fond of ("love" would be putting it too strongly) his wife; to take pleasure in learning and in his garden and his house. But that self-awareness and self-acceptance extends to his perception of others, too – and here is an ability that serves both him and Highsmith well. His "otherness" grants him insight into how people – adversaries and potential allies – think; allows him to foresee what they might be planning. 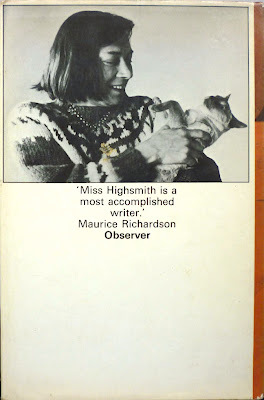 In a sense, this is Highsmith making things slightly easier for herself: by endowing Tom with an acute intuitiveness, she can have him make startling leaps of logic and consequently move the plot along. In regards to the Ripley timeline, the series seems to have the same sort of shifting continuity that you see in comic books or certain film series, such as the James Bond movies. Each of the novels takes place when it was written, since there are contemporary references sprinkled throughout, but it's clear that only about a decade passes between Talented and Under Water. So Talented takes place in 1955 and Under Water takes place in 1991, but as far as Under Water is concerned, the events of Talented happened about a decade before. I once read an interview with Highsmith in which she confirmed that this was the case, jokingly saying that she "cheated" with the timeline. It's been awhile since my last re-reading of the series, but I think I remember Under Ground making reference to the events of Talented being about six years earlier, and Game referring to Under Ground as six months previous. Followed is the only book I can't pinpoint, since I can't for the life of me remember if it made any reference to how long in the past the events of Game were. Under Water, I think, established Tom as being 36 years old, which would be ten or 11 years after Talented. Not that any of this really matters, since they're stand-alone books for the most part (even Under Water, which is a direct sequel to Under Ground), but this kind of fanboy over-analyzing is what we do. Yep, Under Ground does position the events of Talented as being roughly six years earlier, but you're right, Craig: all the Ripley novels are contemporaneous, so it's a similar deal to (some of) the non-Fleming Bond novels and films and, indeed, Richard Stark's Parker novels. But I'll look out for a clue as to where The Boy Who Followed Ripley fits in when I get to it; as you say, fanboy over-analyzing is what we do!